Yesterday I showed you Man With A Golden Gun over Casino Royale. (I am selling my gold top coat. Email me if you are interested) Today I will share with you the rest of the collection. Die Another Day. It is one of my favorites from the collection. It's a redish orange color. It's super shimmery, and you can see brush strokes in the shimmer a bit, but not horrible. This is two coats. Goldeneye. It's just that, golden. lol. I was sorry I didn't swatch this last, since I got gold glitter EVERYWHERE haha. This one was a little thinner, it took 3 coats to get full coverage. Live And Let Die. This is a deep sea blue/green base. It is almost black in certain light. There is a green/gold shimmer in it that kind of reminds me of China Glaze Smoke and Ashes, although its not an exact dupe. Moonraker. I was so disappointed in this one. I had such high hopes. The formula is VERY thin; I dont have bad ridges on my nails, and this points every single one out. It took three coats for full coverage. Her Majesty's Secret Service. This one is a bit reminiscent of Zoya FeiFei. It is a dark blue base packed with metallic shimmer. It was a bit thin and took three coats for full coverage. Skyfall. For being the newest movie, I was a bit underwhelmed by the color choice. Its a vampy, maroon creme. The formula was lovely and it took 2 coats for full coverage. The Living Daylights. When I first saw this in the bottle, I thought I would hate it... but I actually like it. Its got gold, copper and teal hexagon glitters. This is one coat layered over Skyfall. The Spy Who Loved Me. This is a pinkish-orange microglitter. It is very shiny, and a bit reminiscent of Animal-istic from the Muppets Collection (I have not swatched it, it was a recent find). Though, I think this one is a bit more pink. It took 2 coats to full coverage. The World Is Not Enough. This baby had a great duochrome look in the bottle, but it did not translate onto the nail. It is a taupe/gold shimmer. It was a bit thin. It took 3 coats for full coverage. Tomorrow Never Dies. Wow. So pretty! Its a pretty blueish-purple shimmer. I just cant get enough. It's so pretty! It took 2 coats to full coverage. You Only Live Twice. This pink microglitter feels a lot like a couple other OPI's I own (Meep-Meep-Meep and I'm All Ears). There is a gold shimmer in the bottle that doesn't translate to the nail. This is very pretty, and if I didn't own the other two I would be drooling. It took 2 coats to full coverage. 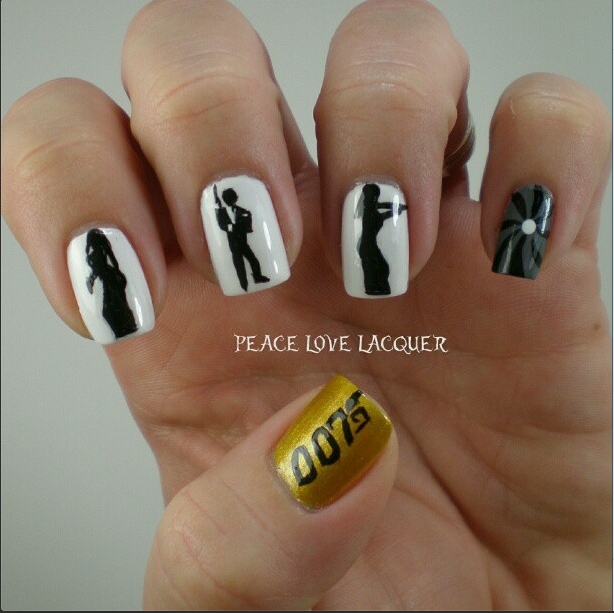 Now that the bond girl textured collection is coming out, I feel like I must own it to go with these. The irrational thoughts of a polish addict!! Great swatches, I love this collection. I havent realized how beautiful Die Another Day is!